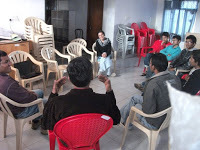 This Sunday about ten people gathered in Anugrah Hall at Herbertpur, representing 3 self help groups: Herbertpur, Dehradun and Meerut. One IPWS was from Kaala Amb (Sirmaur). We started at 2 pm and dispersed by 6.30 pm! After introductions and discussion of ground rules etc., we began with a quite informal but in-depth talk by Ms Jubin, who is a Developmental Psychologist working with children with special needs at Anugrah day care center for such children. She illustrated with a real life story, the need to accept and acknowledge people’s experiences without judgment: Dont judge a man unless you have walked at least ten miles in his shoes! So, people with different experiences should be listened to, and their version should be accepted. To do this, it was important that we reduced our obsession with “my life, my experiences, my pain etc.” and spend sometime with others, especially children with special needs- and genuinely ask ourselves: is this child happy? If yes, what has she/ he based it on? Because we have learned to base our happiness on fluency or dis-fluency at a given moment so “totally” that everyday our joy goes up and down umpteen times like see-saw gone out of control… She also talked about how psychological development of a child howsoever different in small ways, is affected over a long period of time: the child becomes “self-conscious” – as a result his self-esteem suffers. S/he learns to react to people, situations and opportunities differently. She concluded by emphasizing the need for Acceptance and Forgiveness turned towards ourselves. We harbor a lot of anger against ourselves. Her talk was much appreciated and some question- answers followed. Next, we screened the Chennai Documentary:, made by Raja Bhattacharjee. For many of us it was quite a novel idea: to stammer on camera and then, on top of it, talk about stammering itself !! But that is the beauty of Acceptance. And it has to be practiced in order to be experienced and understood. The members felt so encouraged that they decided to be interviewed on camera and let it be hosted on youtube. Next, we screened some scenes from The King’ Speech. This too was an experience felt at a visceral level. We especially liked the scene where the king breaks down and is consoled by his wife, just like any common man. We also liked the subtle interplay- Trained Speech therapists versus the Australian upstart! The Arch bishop recommends to the king that he should take therapy only from “properly” trained doctors- and not from this Australian who has no degrees and who has acted on stage- that is all.. But the king politely declined and stuck to Lionel.. Also, the scene where Lionel purposely insults the king, pushes him in a rage and forces him to say: Listen to me- BECAUSE I HAVE A VOICE! And then, quietly agrees: Yes, you do, my lord! One thing became quiet clear: a good therapeutic relationship will have to be based on complete honesty, transparency and equality.. The PWS has to literally open his soul to therapist, in order to be healed.. When a PWS says in mind: I will take only this much of this therapy, not the whole- and why should I do this or that- no, no, let me use my common sense too.. This may not serve him well in the long run. Then, we had a quick feedback in front of the camera and then, a mini session at coffee shop. Since sachin had to catch a train next morning at 3.30 am, he ran away. Neeraj collected all the phone numbers. Dr Kshitiz and Neeraj planned how to move ahead in their own areas. 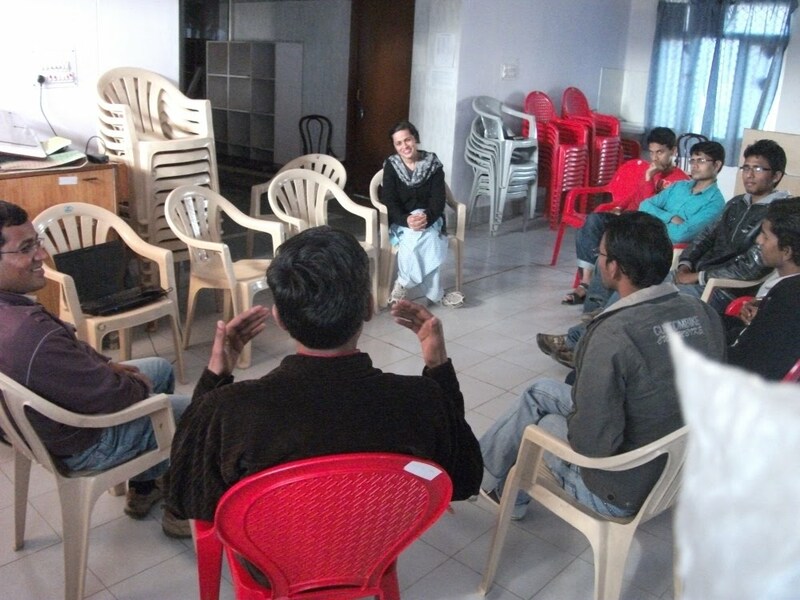 The Meerut group had started from home early in the morning and reached back only about 1 am! BUT It was truly good to have met like this on a sunday, learn from each other and from a Developmental Psychologist too: that was the icing on the cake. Thanks Jubin and Thanks Anugrah! And thanks to all the participants who traveled long distances to be here and encourage each other..
Wow! Nice to see a lot of old faces again (feeling nostalgic :-)! And good job on inviting Jubin. She is really good! Yes Sachin, I myself was quite amazed to see the joy and happiness on the children's faces (inspite of the challenges that they face)when I visited Anugrah last time!